Cornerstone was delighted to welcome His Royal Highness the Prince of Wales on Friday 16th December 2016 to mark the official opening of our exciting new venue for Cardiff. The Prince arrived at 11:30am to cheers from members of our Catholic primary schools. He greeted by Archbishop of Cardiff, George Stack, Mr Christian Brown, Cornerstone Project Manager and the Secretary of State for Wales, the Rt. Hon. Alun Cairns MP. His Royal Highness toured the facility and was shown various displays. He was introduced to the architects and some of the builders involved in the work including two apprentices from John Weaver (Contractors) Ltd. When the Prince and his entourage arrived in the community hall where members of the Metropolitan Cathedral Choir led by Mr Dominic Neville treated them to some choral Christmas singing. 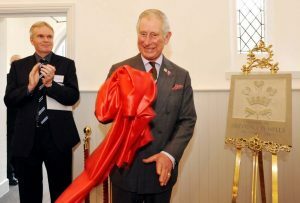 Once the Prince had been introduced to everyone in the room, including representatives of various High Schools, he was invited to unveil a stone commissioned to mark the official opening of Cornerstone, which is to be inset into the building. He then signed the official guest book, the first of many times we hope, before making his way to the next engagement. When the Archdiocese of Cardiff purchased the former Ebenezer Chapel in 2012, Archbishop George Stack had a vision of turning the historic building into a ‘Cornerstone’ of heritage and activity for the city and people of Cardiff. Following a successful £1.2 million Heritage Lottery Fund bid and support from the Hodge Foundation the vision of Cornerstone began to talk place. The Archdiocese appointed Mr Christian Brown OBE KSG as volunteer project manager for Cornerstone. Over the next two and a half years he worked closely with appointed architects Petersen Williams and John Weaver (Contractors) Ltd to bring the former non-conformist chapel back to life as Cornerstone. The restored building now houses ‘The Pantry’ café in what was the undercroft of the former chapel. The main body of the building houses a conference/dining facility, which can hold in excess of 100 guests for a fine dining experience. And the rear hall facility has been retained as a communal facility and now includes an additional ‘Mezzanine’ level. Cornerstone is managed by Spiro’s Fine Dining with the creation of six full-time and twenty part-time positions in this fantastic new venue.